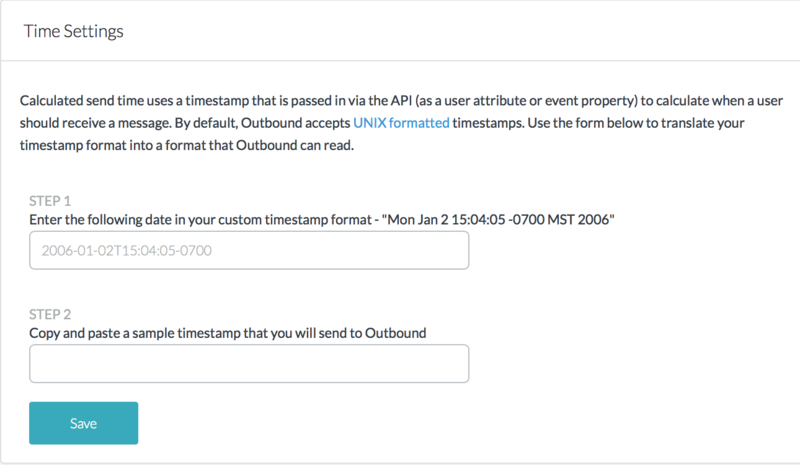 If you're using a delay in your campaign with a calculated send time, but wish to use a format other than the default UNIX timestamps, you can configure them on the Calculated Send time page. Click the Settings icon ( ) in the left-side navigation. Under STEP 2, enter another sample date using your custom date format. Do not use the same date from the previous step. Click Save. If the form saves, the formatting is allowed by the calculated send time feature; if it does not save, re-enter another timestamp format.